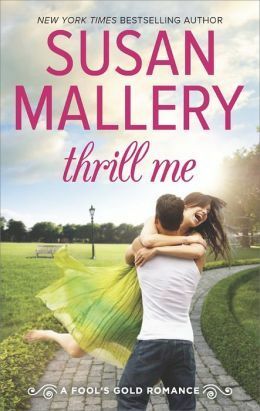 "A Second Chance at Love and Another Great Fool's Gold Story"
THRILL ME is another great Fool's Gold story by Susan Mallery. This one can be read as a standalone. Maya Farlow has been hired to promote the new slogan for Fool's Gold. Mayor Marsha has decided to team her with a celebrity spokesman -- none other than Maya's ex-fiance Del Mitchell, who has made a fortune in extreme sports. It's been ten years since Maya dumped Del and he left Fool's Gold to travel the world and became a very successful businessman. Del has been hurt once by Maya and has no intention of falling a second time. Maya always felt like she had no one to depend on so when she dumped Del she felt like she was protecting herself. Working together reignited feelings that are still there. THRILL ME reintroduced characters from previous Fool's Gold novels. This is a series with so many great characters. Mayor Marsha once again shows her ability to know things that seem impossible, and the octogenarians Eddie and Gladys are up to their usual antics that keep you in stitches. You get to meet the five gorgeous Mitchell brothers. I am looking forward to their stories. There appears to be some family dysfunction among the Mitchell family with surprising revelations as to what's behind it and why things have been the way they are. Even though Del and Maya rediscover their feelings for each other, a secret revealed may destroy their new found relationship. When a friend entrusted you with a secret that involves keeping that information from the person you love what do you do? Even though you feel that the information should be shared with the loved one how do you handle it? Fool's Gold is a great series and Susan Mallery is a great storyteller. I am looking forward to many more stories from her in this series.